The Colorado Rapids must be hurting for business. Today I got this email, right from Hijo de Santo himself. I guess the rapids are really trying to drum up attendance by brining in the baddest, meanest, most ferocious wrestlers from Mexico for an ultimate showdown. Hear what the man himself has to say about his upcoming battle against The Blue Demon. "Buenos Dias, citizens of Colorado. I am El Hijo de Santo. Perhaps you have heard of my fame in Mexico, perhaps not. I have changed the lives of millions and inspired generations with my will and spirit. Either way I come to Colorado to dominate, and you will be witness to my legend this Sunday. It is my 25th anniversary as the top Luchador in Mexico, and when I take to the ring against Blue Demon in the final match on Sunday, the Earth will tremble. I will leap like the grasshopper and I will strike like the jaguar. And Blue Demon will feel the true extent of my power. Only one will walk away from our match on Sunday. And that one is me, El Hijo de Santo. 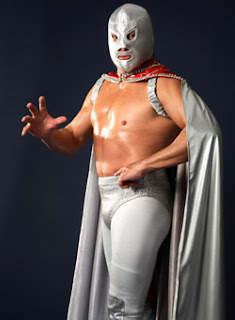 The last thing Blue Demon will hear is the crowd chanting my name....'The Son of the Saint'. Enjoy the fiesta Sunday. Eat the food. Drink in the beer garden. Cheer for your Rapids to defeat their enemy from DC. But remember this, mis amigos: when it comes time for the main event of Lucha Libre on Sunday: cheer for me, and you cheer for victory. SRG InfoTech Blog First Anniversary! !